Ada Mackenzie (1891-1973) – a pioneer in women’s golf – pushed boundaries at a time when few women participated in competitive sports. While a student at Toronto’s Havergal College, she was a member of the cricket, basketball, tennis, hockey and figure skating teams. In 1919, at the age of 27, Ada captured her first of four Canadian Open Amateur championships and six Canadian Closed Amateur championships. 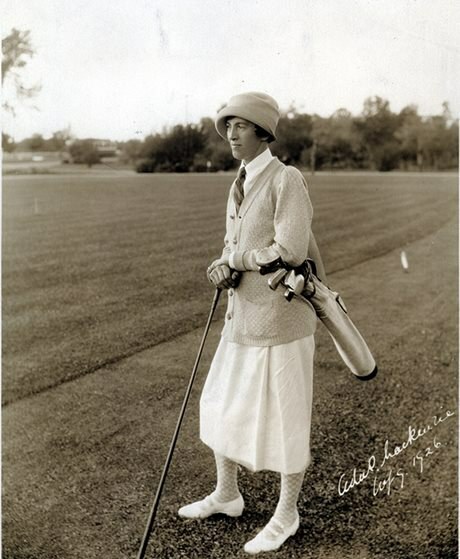 Throughout her golf career, Mackenzie participated in competitions across Canada, as well as in the United States and Europe, claiming numerous titles. In an effort to increase greater sporting opportunities for women, she opened the Ladies’ Golf and Tennis Club of Toronto in 1924. Mackenzie captured her last victory in 1969 at the Ontario Senior Championships at the age of 78. “Keeping active and busy has to be my key to success … Some people have a tendency to overindulge in sports. Not me. I treat athletics like recreation." A Concise History of Sport in Canada, 1989, p. 249. Listen to a CBC interview with Ada Mackenzie from June 20, 1949. View a slideshow of Ada Mackenzie from the Ladies Golf Club of Toronto. Learn more about Mackenzie and her golf career highlights on the Canada’s Sports Hall of Fame website.